Upgrading is a process that converts raw bitumen to synthetic crude oil. Bitumen that is open pit mined is first treated to remove all water, sand, and other particulates. However, this feedstock is very heavy "Upgrading and Refining Process Development." Natural Resources Canada. 15 Nov. 2013. Web. 25 Nov. 2014. <http://www.nrcan.gc.ca/energy/oil-sands/upgrading/5879>. "Upgrading and Refining Process Development." Natural Resources Canada. 15 Nov. 2013. Web. 25 Nov. 2014. <http://www.nrcan.gc.ca/energy/oil-sands/upgrading/5879>. "Upgrading and Refining Process Development." Natural Resources Canada. 15 Nov. 2013. Web. 25 Nov. 2014. <http://www.nrcan.gc.ca/energy/oil-sands/upgrading/5879>. and cannot be processed by most existing refineries. Instead, they must be upgraded to “synthetic crude oil” prior to refining. 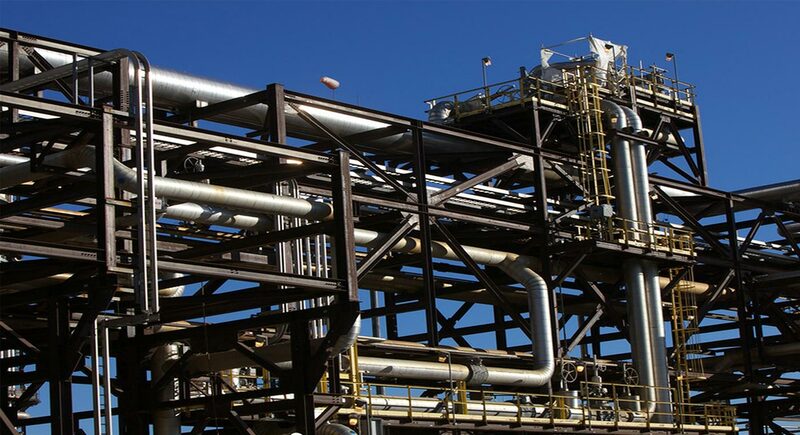 Upgrading is performed in two stages, known as primary and secondary refining. Primary refining aims to break apart the long carbon chains (known as cracking) to create shorter, lighter hydrocarbons. This can be done by either carbon rejection or hydrogen addition. The choice between the two is largely economic in nature. Hydrogen addition offers higher yields at higher costs and is preferential when the price of crude is high. Secondary refining removes impurities such as sulphur, nitrogen, and heavy metals. The need to upgrade the heavy crude from the oil sands renders bitumen derived petroleum products more energy intensive than conventional crude. Some estimates suggest that bitumen products have 3.2-4.5 times more GHG emissions per barrel than conventional crude from North America Huot, Marc, Lindsey Fischer, and Nathan Lemphers. "Oil Sands and Climate Change. "Energy Commerce House. Pembina Institute, 14 Oct. 2011. Web. 25 Nov. 2014. <http://energycommerce.house.gov/sites/republicans.energycommerce.house.gov/files/Hearings/EP/20120320/HHRG-112-IF03-WState-DyerS-20120320-SD002.pdf>. . With growing energy needs of developing nations and dwindling conventional crude supplies, issues such as upgrader efficiency and economy will need to be addressed in political, environmental, and economic fields. The energy contained in the oil sands is immense, and sufficient upgrader technology will be necessary to utilize the resource to its fullest potential. Scientific research is currently underway to achieve 2-3 fold improvements in upgrading efficiency. With respect to climate effects, carbon capture and storage (CCS) is seen as a potential method to reduce environmental impact. For example, the Shell Quest CCS Project aims to capture 35% of the emissions from the Scotford Upgrader in Edmonton, Alberta when online Huot, Marc, Lindsey Fischer, and Nathan Lemphers. "Oil Sands and Climate Change. "Energy Commerce House. Pembina Institute, 14 Oct. 2011. Web. 25 Nov. 2014. <http://energycommerce.house.gov/sites/republicans.energycommerce.house.gov/files/Hearings/EP/20120320/HHRG-112-IF03-WState-DyerS-20120320-SD002.pdf>. Huot, Marc, Lindsey Fischer, and Nathan Lemphers. "Oil Sands and Climate Change. "Energy Commerce House. Pembina Institute, 14 Oct. 2011. Web. 25 Nov. 2014. <http://energycommerce.house.gov/sites/republicans.energycommerce.house.gov/files/Hearings/EP/20120320/HHRG-112-IF03-WState-DyerS-20120320-SD002.pdf>. .
^ "Upgrading and Refining Process Development." Natural Resources Canada. 15 Nov. 2013. Web. 25 Nov. 2014. <http://www.nrcan.gc.ca/energy/oil-sands/upgrading/5879>. a, b Huot, Marc, Lindsey Fischer, and Nathan Lemphers. "Oil Sands and Climate Change. "Energy Commerce House. Pembina Institute, 14 Oct. 2011. Web. 25 Nov. 2014. <http://energycommerce.house.gov/sites/republicans.energycommerce.house.gov/files/Hearings/EP/20120320/HHRG-112-IF03-WState-DyerS-20120320-SD002.pdf>. Sorry, we do not yet have a video specifically for Upgrading. We are adding new videos to StudentEnergy.org weekly, but in the meantime check out this video on Oil Sands. Oil Sands is a form of heavy oil found in sand and rock primarily in the Athabasca region of Northern Alberta, Canada. Oil Storage refers to tanks or terminals (a group of tanks) used to store produced oil above or below ground.